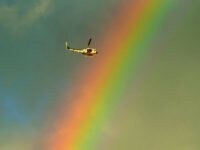 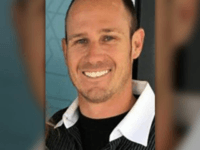 Almost 2,000 Ventura County, California, residents paid tribute Saturday to fallen firefighter Cory Iverson, who died on December 14 while fighting the Thomas fire. 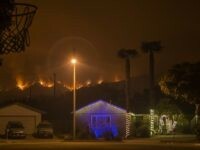 The Thomas fire, which continues to ravage Santa Barbara and Ventura Counties, is now officially the second-worst in the history of California — and is rapidly closing in on the top spot. 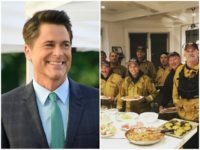 Actor Rob Lowe showed his appreciation to California firefighters working to battle the dangerous Thomas Fire by hosting a cheeseburger dinner for them, after they saved his own home from the destructive flames. 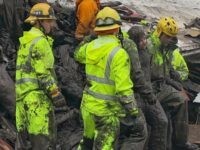 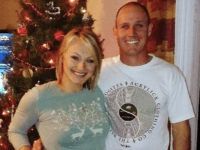 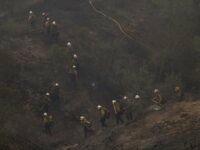 Firefighter Cory Iverson, 32 died Thursday while fighting the deadly Thomas fire, which is raging across Santa Barbara and Ventura counties in Southern California. 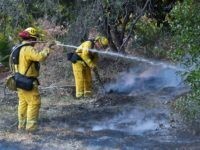 Firefighters in Santa Barbara County are racing to finish containment lines to restrain the Thomas fire before high winds arrive on Friday evening that could push the blaze further west and threaten the city of Santa Barbara itself. 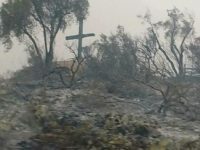 An iconic cross in Ventura County, California survived the Thomas Fire that ravaged the area over the past week and was left standing in what many people are calling a miracle. 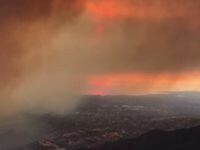 The Thomas fire in Ventura County and Santa Barbara County was still blazing strong as of Tuesday morning, while Southern California’s other wildfires were largely contained. 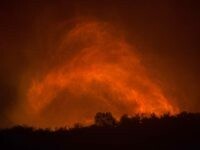 The California fire known as the Thomas fire, which has scorched Ventura County and now Santa Barbara County, is now the fifth-largest in the history of the state, reaching an extent of 230,000 acres on Sunday with only 10% containment. 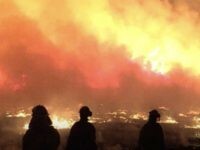 Firefighters are bracing Sunday morning to stop a wall of fire that is advancing on Carpenteria and Montecito, two towns that line the southeast approach to Santa Barbara along Highway 101 and that stand in the direct path of the massive Thomas fire. 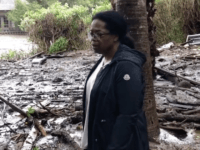 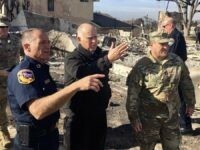 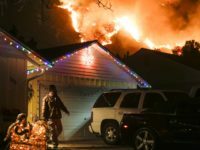 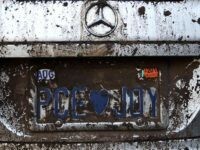 California Governor Jerry Brown blamed climate change for the California fires that have devastated the state this fall during a visit to assess the damage in Ventura County on Saturday. 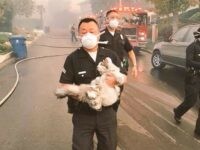 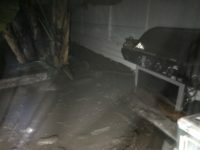 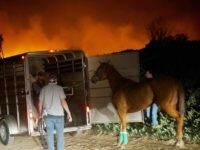 Los Angeles Police Department officers, Los Angeles Fire Department firefighters, and local volunteers have been working feverishly to save animals at risk from ongoing fires in the region. 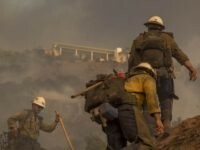 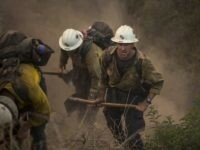 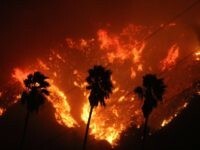 Los Angeles firefighters are racing against predicted high winds Wednesday night and Thursday morning as several fires burn throughout the area — with very little containment, and more extremely dry and windy weather predicted. 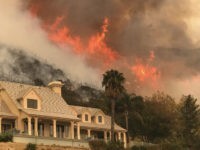 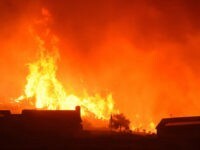 A masive wildfire that erupted overnight and burned over 30,000 acres has forced 27,000 people in Ventura County to evacuate their homes as 150 structures were destroyed, according to reports from local news and wire services.